Powdered Sauces, fish, and bananas – must be those Daring Cooks again! 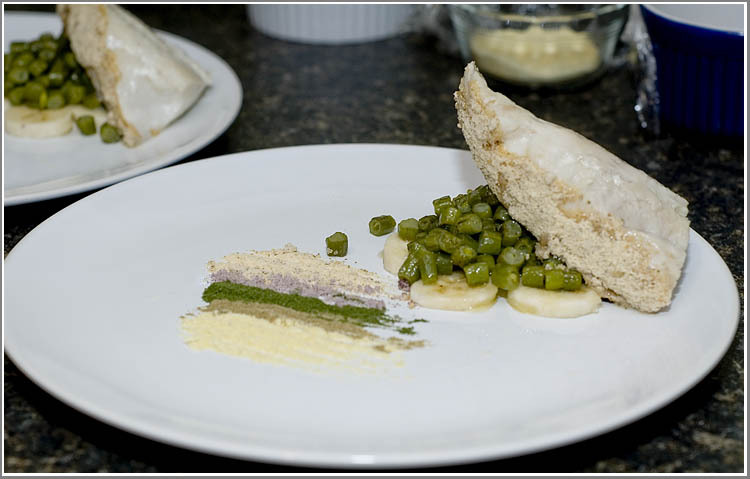 This month we are graced with a challenge from Sketchy: Skate, traditional flavors powdered.This is a dish from Grant Achatz, found in the Alinea cookbook – page 230. I picked a recipe that could be completed without having to order a bunch of specialized chemicals or powders. Just a little work and you can make this, the techniques are not very hard and only require a few tools. Let me put this out there first: I’m not sold on the whole Molecular Gastronomy fad. There have been some pretty cool cooking advances made because of it, but for the most part, I’m not a huge fan. I decided to go with with this dish because it seems to have taken a good part of food science while still keeping the actual food in a normal state. Now that my ranting is over, let me tell you this dish turned out great. The concentrated powders combined with the butter poaching liquids created a myriad of sauces on my plate. The bright colors and pungent smells were very surprising and quite flavorful! The surprising addition of sweet, ripe bananas incorporated with the sauces perfectly. The dish gets some huge bonus points by being very easy to prepare. Once the powders were all prepared, the dish only took a few minutes to prep and cook which is a huge plus. I was lucky enough to have an Excalibur dehydrator to make the powders which greatly simplified that aspect of the recipe. There were no real surprises preparing the powders and everything came out just as expected. There was one small drawback to actually cooking the fish and green beans: a WHOLE POUND of butter. I really had to read the recipe a few times to make sure I didn’t make a mistake, but sure enough, I didn’t: a whole pound of butter. I was slightly annoyed that, after poaching the fish, the butter sauce is pretty much discarded. After working in a restaurant for a few months, I should have expected this, but it still bothered me to just about waste all that butter just to poach a few pieces of fish…it did make the fish taste real good though! * Beurre Monte – 454g butter (4 sticks, 1 pound) cubed and cold, 60g water. In a small saucepan, bring the water to a boil, remove from heat and whisk in the butter 1 cube at a time. This should from an emulsion. Keep this heated, but under 195 degrees. The emulsion will not break – this is your poaching liquid. once dried, all powders should be pulsed in a coffee grinder/spice mill/morter and pestle then passed through a chinois or fine mesh strainer. zest 300g of lemons (10.6 oz), remove the pith from the zest and poach in the simple syrup three times. dry with paper towels and move to a dehydrating tray. 130 for 12 hours. pulse the zest in a coffee grinder, pass through chinois, and mix with citric acid/vitamin C powder. If you do not have a dehydrator, place in microwave for 8 to 10 minutes at medium powder. Once dried, follow the other instructions. blanch the parsley in boiling saltwater for 1 second, submerge the leaves in ice water for 3 minutes. Dry on paper towels and place on dehydrator tray. 130 for 12 hours. grind and pass through chinois. If you do not have a dehydrator, place in microwave for 30 seconds, turn over leaves and microwave for another thirty seconds. They should be dry by now, pulse in coffee grinder, pass through chinois and reserve. microwave at medium power for 20 minutes. run the capers under cold water for two minutes to remove some of the brine. dry on paper towels and dehydrate for 12 hours at 130 degrees. microwave instructions are unclear. Dry them as much a possible with paper towels, the microwave on medium for 1 minute. Check the moisture content and stir them. repeat for 30 second intervals until they are dry. If you use this method, pleas post the time needed to dry the capers. Once dry, pulse and sift the powder. Mix it with the onion powder. If you cannot find the cream powder, you can substitute Bob’s red mill non fat dry milk powder, or even carnation instant milk powder. The substitutions will alter the flavor a little, but you will still get the general idea. Preheat the oven to 350 degrees, sift the cream powder into a fine layer on a silpat or on parchment. bake for 4 minutes, then remove for heat. If it bakes for too long, it will burn. Be very cautious with all powders in the oven. They all go from browned to burnt in a few seconds. Grind the banana chips in a coffee grinder and mix with the toasted cream powder. Pass this through a chinois and reserve. bring 300g water and 300g beurre monte to simmer over medium heat, add skate wings and simmer for 2 minutes. Remove the pan from heat and flip the wing over and let rest in pan for two more minutes. Transfer to warming tray lined with parchment and season with 5 grams of fine sea salt. The Skate can be replaced with flounder or cod. If you can get skate that is not ‘prepared’ IE – Skinned- get the fish monger to prepare it for you. The powdered cream can be omitted completely, just replace it with more banana powder, or pineapple powder. Possibly non dairy creamer, but I have NO idea what would happen if you tried to brown it. The poaching liquid is pretty much butter – it could be replaced with other poaching methods. Water, wine, bay leaf, garlic clove, pepper, etc. Try to go easy on the salt in the liquid if you use a replacement. Sketchy: Skate, traditional flavors powdered. Colorwise, the whole dish just comes along nicely. A truly beautiful combination of colors… love it! I have to admit I skimped on the butter, using two sticks instead of four. It worked, and I still had a lot to throw away! I saw that one of the Daring Cooks solved the butter waste problem by cooking the fish sous vide with just a little butter. I thought that was a brilliant solution. I’m totally with you on the pound of butter and waste of all of it, but I succumbed anyway, and now regret it..as I hate waste too. 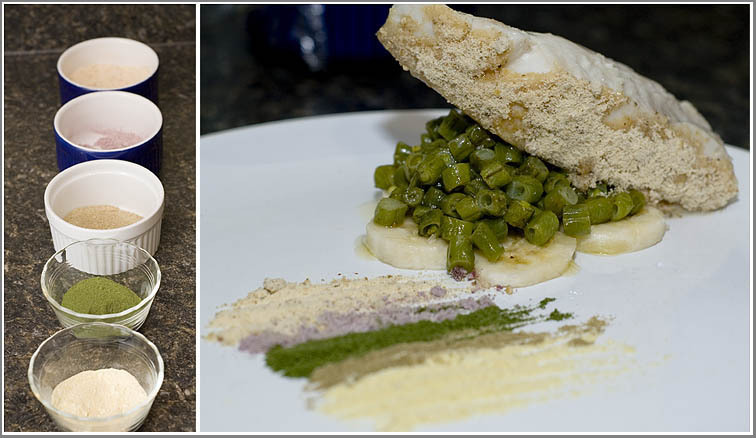 That said, great write up, and your fish and powders look perfect. Nice, clean plating, beautifully arranged. Well done!